Often we’re asked to provide railings for ramps and stairs in public areas. We usually have to explain why the railing used for fall protection is not sufficient per code to meet “handrail” requirements. 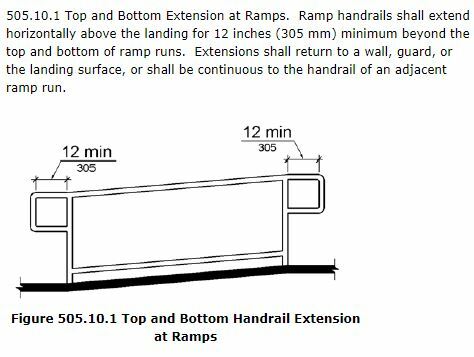 This is particularly true in a situation where you are attempting to meet ADA standards such as for a ramp. Handrails have specific diameters, heights, returns and extensions that must be met. You can read all about them here. The illustration to the right was taken from that document. Railings for fall protection have different height requirements, have requirements for spindle spacing and often due to the need for lateral strength, have a heavy, reinforced top rail. That top rail often doubles as a protective cap if the railing is wood. This makes the top rail far to wide for a proper grip, even if the other requirements are met. Once you know the requirements, it’s pretty easy to spot the failed attempts. It’s amazing how many public buildings have these issues. There are several I’ve noticed at municipal structures around Marshall County. (Though fortunately, nothing as bad as the one to the left!) What’s particularly sad is when an obvious attempt at compliance has been made, but the execution has ended up subpar. A contractor is hired without checking references and a “plan” is created based on assumptions, resulting in partial or limited compliance. This often means expensive installations are completed that don’t meet the requirements. Many compliance officers are not as versed in the requirements as they should be. Custom metal railings can be expensive. Ditto for some of the piece-together plastic systems found online. Because of the varying slopes, and direction changes of ramps, often the specific angles that are needed are not available. 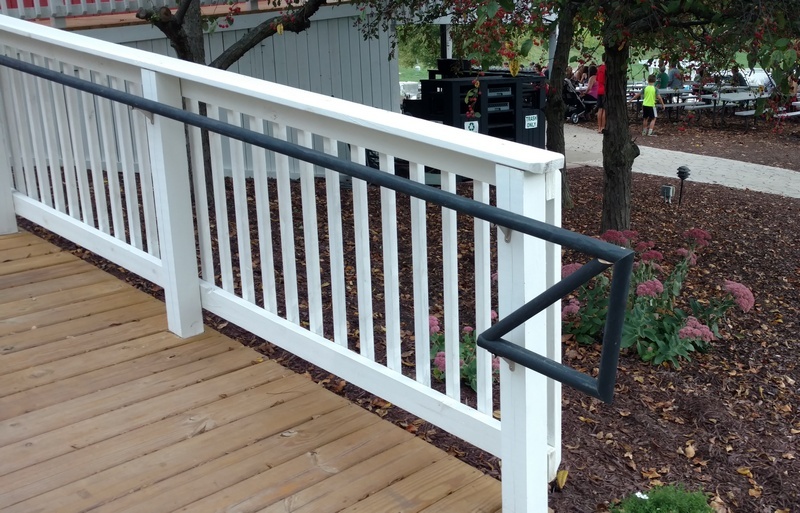 I found a creative handrail at the Round Barn in Baroda, Michigan this weekend. In general, wood railings are installed ignoring the code requirements for looped returns at the ends of the stairs or ramp. In this case, the installer mitered a wood railing together to provide a looped return. I think they can be forgiven for not leveling the railing at the end. The ramp is pretty low slope. The only possible negative I see here is that the bottom corner could still provide a catch point for clothing and the rules would say it should either close the loop or return to the wall. Technically it does close the loop so it may meet the letter if not the spirit of the regulation. But I want to commend them on finding a creative and cost effective solution to the railing requirements. “Imitation is the sincerest form of flattery” [Charles Caleb Colton] and I will keep this installation in mind in the future when I need a budget solution to the railing requirements. If you have an ADA compliance situation that you would like us to check out for you, let us know. We are well versed in the requirements and are not too proud to refer you to an Architect or other expert in cases that are outside our expertise and experience.